Blocked toilet causing a stink? Call in the professionals. A blocked toilet can be a pretty unpleasant experience. It can be smelly and embarrassing (especially if you happen to be a visitor!). It can be expensive to clean up household items that have been damaged by an overflowing toilet, not to mention a health hazard. When people put the wrong things down toilets, toilet pipes can block up. Some of the things which shouldn’t be put into a toilet are food scraps, paper, rags, cans, bottles, grease and fat. 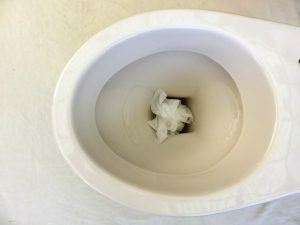 You can try unblocking a toilet yourself. The best way to do this is using a plunger. To do this put gloves on and place the plunger right into the base of the toilet bowl. Plunge up and down. You may have some luck in loosening the blockage using a plunger but generally plunging will only work for small blockages. If you see water backing up in the sinks or showers whenever you flush, it’s time to call a professional drain clearing company. Professional drain clearing companies should be able to clear the line completely using a high pressure water jet. Professional drain clearing should keep your drains clear for at least 3 months. However depending on the condition of your drains and proximity to aggressive tree root systems, drains can block up again more quickly. If you experience a blocked toilet repeatedly it could indicate there is something more seriously wrong with your drains. If so you will need to ask the drain clearing company to conduct a a CCTV inspection of your drains. They will diagnose the problem so you can make an informed decision about how to fix the problem. If you would like to know more about our plumbing, drain clearing or pipe relining services, don’t hesitate to get in touch on 1300 358 434 or contact us here.